A hot shower is one luxury of modern life that people take for granted. We tend to only really appreciate it when we can’t have one. The advantage of tankless water heaters is that you will never run out of hot water. Tankless heaters only heat the water you use, so there is always enough. And, tankless water heaters are often both more economical and kinder to the environment. Sorting out heat output vs. flow rates and energy efficiency can be bewildering. We’ve done our best to simplify things for you, with a short list of the best options. There are a few places where the advantages of a tankless water heater are really apparent. For some uses, this sort of heater is the best option, and can save you some time, money, and most of all stress. 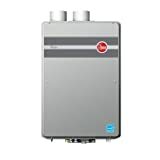 Unlimited Hot Water – The biggest advantage of a tankless water heater is that it cannot run out. With a traditional hot water system, there is a finite amount of hot water. Once it runs out, it’s gone until a new tank has been heated. A tankless heater keeps everybody happy by heating as much as is needed, when it is needed. For families competing for hot showers, or businesses that can’t afford to wait, a tankless heater can go a long way toward keeping the peace. Also, tankless heaters are often better at keeping the water temperature consistent. You don’t have to worry about sudden fluctuations, making them both safer and more comfortable to use. Energy Efficiency – Tankless heaters can be more expensive up front, but they are money savers over the long term. Storage water heaters, the more traditional form, have to keep a large tank of water hot at all times, ready for use, and this can be expensive in terms of energy use. Tankless heaters only heat water when it is needed, and so usually draw less power. Smaller – Tankless heaters don’t require big standing tanks of water, and so require less space. Rather than having the heater in the basement, they can be mounted nearer to where they are needed. Less Risk of Water Damage – No tank of standing water means a reduced risk of rupture or spillage. While any fitting or connection can fail, tankless water heaters are less likely to cause problems. Tankless water heaters do have some potential problems. When choosing water heaters, consider how you use your hot water, and what might be the best options for your use. Minimum Temperature – Many hot water heaters have a minimum flow requirement. In other words, it needs a certain amount of water flowing through it in order to activate the heater. Mid-range temperatures are reached by mixing hot and cold water, and the minimum flow requirement can result in a sudden jump from cold to hot. Water also only stays in the system for a short time, so the more you draw, the cooler the water. Finding the right temperature can take some practice. Heat Source – Tankless heaters generally use either electrical or gas heating systems. Other, less traditional systems, such as solar water heating don’t work with tankless systems. High Start-up Cost – Tankless heaters can cost several times what a storage water heater might. In addition, when converting to a tankless set-up there might be additional costs involved with upgrading electrical or gas systems. Modern tankless systems can accommodate a variety of hook ups; however, and over the long term they are generally worth it. When deciding what heater is best for you, the major determining factor will usually be size. Tankless heaters can either be big enough to supply the whole house, or come in smaller units meant to supply just one water device. Consider which you need, and then add up the total flow rates for every device the heater will be supplying. Information on average flow rate for common water devices (such as showers, faucets, dishwashers, etc.) can be easily found online. You’ll also need to have an idea of what your groundwater temperature is, which can often also be found online. 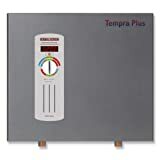 Tankless water heaters are rated by temperature rise over water flow. For example, a gas heater might have a rate of 70 degrees F (39C) over a flow of 5 gallons per minute. That means it will reliably raise the temperature of water flowing at 5 gallons per minute 70 degrees from the supply. Using the information you’ve gathered on the total flow rate and temperature rise, you can take the first steps in finding the best water heater. An automatic flow modulator, to keep the temperature constant when the demand is high. Variable temperature control. Some heaters offer a higher degree of control when setting the temperature, both as to temperature range and fineness of control. Indoor vs. Outdoor Units. Indoor heaters require venting to the outside, and may need more space. Outdoor units requiring less venting, and can be more suitable for cabins and smaller buildings. Like a storage water heater, there are a wide variety of options available at many different prices. Higher flow and more powerful heaters are of course, more expensive. There is also a difference in price between electric and gas heaters, with electric heaters generally having a lower flow with a correspondingly lower price. Electric heaters designed to supply one or two devices can cost as little as $100 or $200, while gas heaters meant to supply a home can cost over $1000. Most fall somewhere closer to $500 or $600. Check out the reviews below for more information. 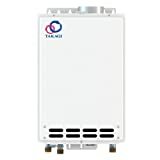 The Takagi Tankless heater has a 6.6-gallon per minute flow. 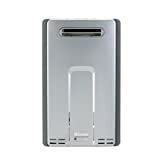 It is a gas heater, but also requires a standard 110-volt electrical supply. It’s small dimensions (6.7 x 13.8 x 20.3 inches) means it can fit in small areas. It comes with a warranty that requires installation by a Takagi certified technician. However, it can be installed by a homeowner with a little experience and some careful reading of the manuals. This is a lower capacity heater, which means it can’t handle more than one shower and a couple of faucets at once at anything other than the lowest temperature setting. 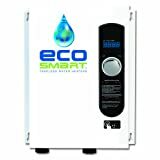 The Ecosmart ECO 18 has a flow of around 2.5 gallons per minute, which is a lower flow rate. For a household or other uses with low demand, like a vacation home or as a second heater, it can be great. The heater has a digital temperature control, which allows you to set the temperature in increments of one degree, so you can do a lot of fiddling to get the right heat vs. energy cost balance. The heater does work best when used with plumbing that has flow restrictions. 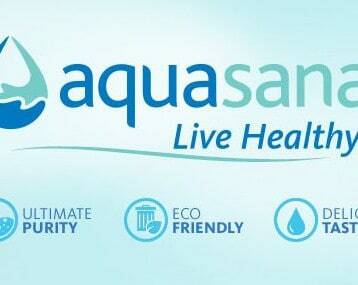 The manufacturer also advises it is best used in areas where the groundwater temp is 62 degrees or above. This tankless heater has a 6.4-gallon per minute flow. It is an outdoor heater, and so not suitable for installation inside a home. However, it is straightforward enough that is can be installed by anyone with a little bit of know-how. It is a gas heater, which can be tricky to install, and it’s important to be careful with the gas line. It does a good job heating both at the high and low end of the temperature scale, and with a 0.26 gallons per minute minimum flow rate, there’s no sudden cut out of hot water at the lower end. This is an electrical water heater meant to serve a whole household. It does everything a tankless heater is supposed to do: offers an unlimited supply of hot water and saves a bunch on the energy bill. The plus model of this heater comes with a ‘pressure-balancing feature.’ If the flow demand exceeds the supply, the heater will reduce the cold water supply to keep the temperature constant. However, it’s flow is a little low, and it is noticeable that the flow diminishes when more than one water source is on at a time. Like the 20 plus, the 24 plus is an electric heater meant to supply hot water to an entire home. The 24 plus offers a higher flow capacity than the 20 plus, however. It also has the pressure-balancing feature. At low temperatures, it can fluctuate between hot and cold. The minimum flow rate means that it can be difficult to control the temperature. The flow can also be low if there are multiple water sources going at the same time. With a 9.5 gallon per minute flow, this heater can supply several water sources running simultaneously without a fall off in temperature or water flow. The highest water temperature you can set it to is 120 degrees, which isn’t actually that hot. It can also take a few moments for hot water to start flowing. However, it does live up to the promise of an endless supply of hot water. 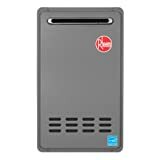 This is also a condensing type water heater, which while a little more expensive can be easier to install and have less complicated venting requirements. The Ecotemp L10 is an outdoor electrical heater. It is battery powered, and so isn’t a great choice for a home heater. For a cabin or other use of lesser demand, it can be great. It’s 120 upper limit means that it is best used in areas with higher ground water temp. There have also been some reports of technical issues with this unit, and difficulty getting help with technical support. Otherwise, it is simple to do a DIY install. 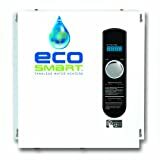 The Ecosmart ECO 27 is similar to the ECO 18, but has a larger flow. It can have up to a 6 gallon per minute hot water flow, which can potentially supply a whole household without a drop off in either temperature or flow. Italso works great in areas with a lower groundwater temperature. It is an easy install, however it’s important to make sure the electrical system is up the requirements. The upper temperature limit is 140 degrees, which is higher than many similar heaters and which means higher possible temperatures. This is a great, high flow heater. It can provide hot water to a number of outlets with no problem. There is, however, a delay between turning the hot water on, and when it is delivered to the faucet. It is a gas heater; so self-installing might not be a great idea. It is also a condensing heater, so make sure you have the right (PVC) sort of venting when you install. It should also be installed near a floor drain, as the condensate drains directly out of the heater. The condensate is slightly acidic, and can be problem with older drainage systems. This unit should probably be installed by a professional, as it’s a complicated install. The unit is an exterior heater, but it can be painted or placed in an alcove and will still work fine. It can take a minute or two for the hot water to reach the faucet or shower. However, it works well, and the supply of water is constant even when multiple outlets are going all at once. The default top temperature is 120 degrees, which is not super hot, but that can be upped to 140 degrees. Steady and strong hot water is key to any bathroom, we hope you find these reviews helpful, and you find the very best hot water system for you and your family.